Train Hire is the low cost, high value train charter option. Our extensive experience and wide contact base allows us to select the best trains available for the most cost-effective solution for your travel. Train Chartering, now in its 13th year, has provided private train charters and carriage hires to a wide range of clients; operating mainly in the UK, Europe and North America, we can arrange travel almost anywhere in the world. We set up in 1998, focused on private charter trains, when the term 'train chartering' was not in use, even in the rail industry; it is now part of our registered trade mark. Train Hire offers a rail-based travel solution for any reasonable budget, for groups of 100 or more. 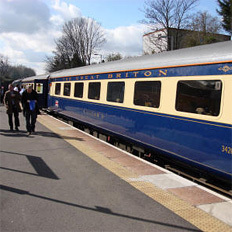 This can include seat-only in public carriages, private carriages or a whole charter train, depending on a number of factors such as the group size, route and budget. We commit to providing you with the best option at the lowest price for your particular group. Train Hire will suggest road / sea / air options for transfers or related travel through Transport Charter. Why is "How to get there" often the last item on the planning agenda? We don't think that "Problems with transport" should be the first thing people talk about on arrival or a key issue after the event. Train Hire will advise you about the best way to offer catering to your passengers, whether by 'carry-on', sandwiches delivered to the train by well-known outlets or through the normal rail catering services. Train Hire assists in the marking of seats, carriages or trains to make boarding easy and to, if required, project the group identity. Train Hire benefits from the extent and professionalism of Train Chartering's long experience in the management and quality delivery of rail travel solutions.